Advances in technology, combined with the ever-evolving needs of the global market, are having a strong impact on the textile and clothing sector. 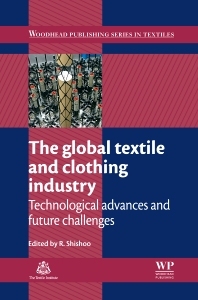 The global textile and clothing industry: Technological advances and future challenges provides an essential review of these changes, and considers their implications for future strategies concerning production and marketing of textile products. Beginning with a review of trends in the global textile industry, the book goes on to consider the impact of environmental regulation on future textile products and processes. Following this, the importance of innovation-driven textile research and development, and the role of strategic technology roadmapping are highlighted. Both the present structure and future adaptation of higher education courses in textile science are reviewed, before recent advances in textile manufacturing technology, including joining techniques, 3D body scanning and garment design and explored in depth. Finally, The global textile and clothing industry concludes by considering automating textile preforming technology for the mass production of fibre-reinforced polymer (FRP) composites. With its distinguished editor and international team of expert contributors, The global textile and clothing industry: Technological advances and future challenges is an essential guide to key challenges and developments in this industrial sector. Research directors, managing directors and textile and clothing development professionals in sectors ranging from design, production, marketing and management.